The DeWalt 20V MAX* Hedge Trimmer has a high output motor and laser cut, hardened steel blades engineered for clean, fast cuts on branches up to 3/4" thick with 22" of blade length. The compact and lightweight 7.5 lbs. design maximizes maneuverability and minimizes stress on your arms. 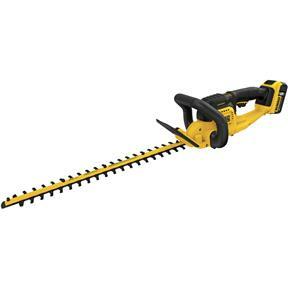 Includes hedge trimmer, 1 20V MAX* 5.0Ah lithium ion battery, and standard charger.